When sunlight travels through a semi-transparent material, the light becomes richly colored. Light that just bounces off the surface is fairly dull by comparison. This “stained-glass-window effect" is called transmitted light, and you often see it when the sun shines through the green or yellow leaves of a tree. You might also see transmitted light when the sun backlights colored balloons, a sailboat’s spinnaker, or a translucent nylon awning. 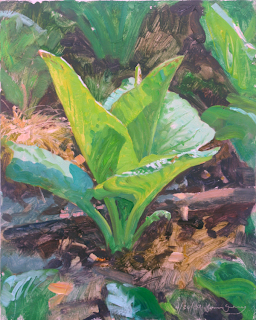 This on-the-spot oil painting of a skunk cabbage plant is a study of transmitted light. The bright yellow-green area is much more intense than the other greens. 1. Transmitted light, with intense chroma or saturation in the yellow-green range. 2. The leaf in shadow, facing downward. This is the darkest green, and would be even darker if it wasn't picking up reflected light from the adjacent leaf seen edge-on. 3. The leaf in shadow, facing upward. These ‘up-facing planes’ are blue-green, because they are picking up the blue light from the sky. 4. Sunlight reflecting off the top surface of the leaf. This is the highest tone or value, and the most textural, especially where it transitions to shadow. But the chroma is not very intense, because most of the light bounces off the waxy cuticle of the leaf. When you are painting a faraway tree backlit by sunlight, it’s good to keep in mind these four conditions: transmitted, downfacing shadow, upfacing shadow and sunlit. 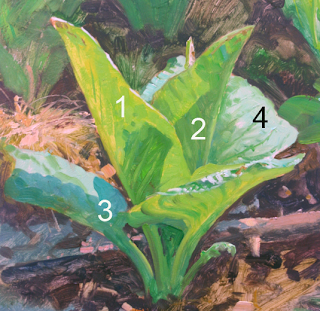 These colors, visible in the skunk cabbage up close on a micro scale, are present here, too, mixed together like tiny pixels even if you can’t really see the component leaves. The distant foliage is a composite of all four color elements, blended with the atmospheric effects. As you can see in this faraway view of autumn maples, there are more leaves shining with transmitted light at the lower left margin of the tree. The leaves in the central area are darker and duller because they’re lit by the cool skylight. Wow, I love this effect so much, and I'm glad to have found your blog today. :) Overcompensating for the lack of glowing leaves in other people's paintings is definitely a goal of mine in learning to paint! So thanks for your nice little explanation. I'm also curious if this particular effect is implemented at all in any computer graphics renderers - a shame if it isn't. p.s. 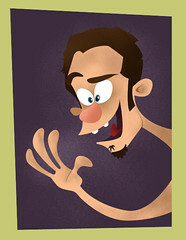 Have you seen the artist at artbytheo.deviantart.com? He's one of my favorites on deviantART, and you're a noticeably significant influence on his work. Just curious what you'd think, since I admire both of you so much. These highly informative and concise postings about illustration craftmanship always blow my mind, thanks so much. Question: I guess that painting plein-air challenges you to think twice about what colors you take with you (Don't fear - I am not asking for something like a definitive list...;-) )? do you rely on mixing from a very basic set of colors or do you kind of put together a large variety of colors (maybe trying to match the expected subject's color pallette's)? This post has taught me so much about painting in so few words. Thanks! Quick responses: Hadn't seen "ArtbyTheo" before, but hats off to him--he has a great sense of atmosphere and mood, and now he's an influence on me! 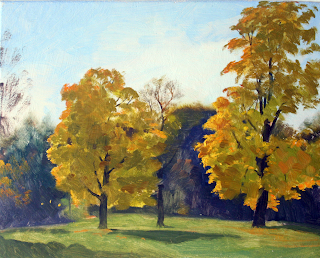 Murat, I am a real fan of limiting the number of colors used in plein air work. One of my favorite limited palettes is from John Stobart: White, Cad Yellow Light, Winsor Red, Ultramarine Blue, Permanent Green, and Burnt Sienna. You can paint any color in nature with those six colors. This is a great subject for a future post. Four years of art school and this is the first time I've heard light explained so well. Thank you for writing blog posts that apply to serious painters (not just general fans)- this stuff is great. I've learned more about painting in the weeks that I've been reading this blog than I did in my painting classes at school. Thanks. This post has helped me immensely, thanks so much for the tips. :) I know it will affect my art greatly. Now if only I could get tips for dinosaurs and things, I have an odd love for reptiles and insects (and have been called a tomboy as a result :p)..